Most of the time I spend blogging (i.e. typing away on my computer) I'm wearing distinctly un-blogworthy outfits! Today I'm styling a casual, stay-at-home outfit that is both comfortable (and very PJ-like) while still looking like a 'look'. Plus, I'm sharing 2 simple tweaks that will make an outfit like this one look just that little bit better. Comfortable... nothing digging in or squeezing. Easy to wear... throw on and go. Easy to move around in... bending, stretching, curling up in a ball while drinking coffee? No problem! This outfit took seconds to throw on and is suitable for a day of blogging and anything else that might come my way. Answering the door would be no problem in this getup. Even popping out to walk Jake or grab a pint of milk would leave me blush-free! I started out with my trusty base layers... a thermal top and leggings. Then I added a polo-neck and snake patterned jogging-bottom-style trousers over the top. Not the most flattering look but a decent base. Next, I added a floaty (but structured) camisole to add interest and cover the elasticated waistband. Elasticated waistbands rarely look good. Then a long-line knitted waistcoat to add more interest as well as warmth. The colour also ties in with the trousers and clashes nicely with the grey top. Finally, a chunky necklace makes the ensemble seem more of an 'outfit' than just a pile of clothes... if that makes sense!? I've mixed cool and warm subtle and soft colours here, but you can obviously mix any colours you like. This layering formula also works really well with monochromatic looks... if that's your bag. I love the soft taupe, grey and white palette you've chosen Anna. We don't see you in these muted tones that often and it's a nice change! 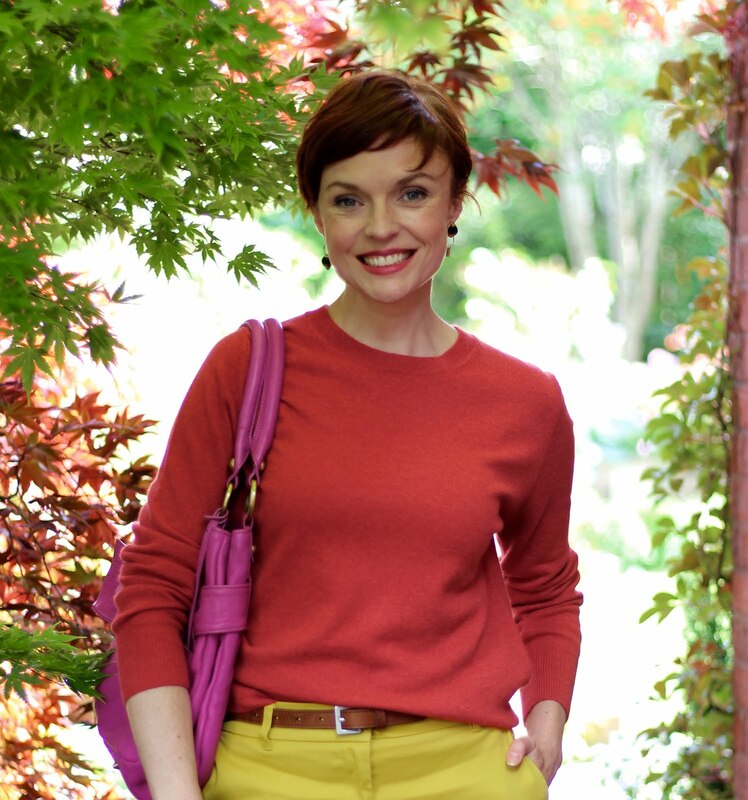 You look just as lovely as you do in your signature brights! ooo, love the neutral pallete here Sam! Ive seen several people now in snakeskin pants.. very tempting! I know what you mean, and for me, when I am at home.. I am probably "the lady in the purple robe" by some package drivers! This looks great and comfy! This is very similar to what I lounge around in. The little tweaks, like adding jewelry, cuffing the trousers and scrunching the sleeves really work great. once more, you totally rock!, this is a comfy&cool outfit perfectly suitable for any outdoors activity and it's also perfect to stay at home!. Love how you show us how the layers add interest and how lovely is the final touch of the accessories and the push up sleeves! So wise and brilliant!